My good friend Cristina Heustis emailed me this recipe and I kept it in my inbox knowing I wanted to make it soon. Sooo, when I was cleaning out my inbox yesterday and came across it (one year later), I decided there's no time like the present to finally give it a try. She was so right when she said it was amazing! I love it and it will definitely be in the regular rotation for years to come. The original recipe calls for corn but I subbed a medley of diced bell peppers (red, yellow and orange) instead. This is one of those versatile dishes where you can change up the veggies to suit your preference, and you could easily leave out the chicken to make it vegetarian. Also, I used O Citrus Champagne Vinegar instead of white wine vinegar and it definitely added a bright, fresh tang to this dish. This salad is hearty and flavor-packed, not to mention incredibly healthy. I can't wait to make it again! Farro is one of the oldest grains cultivated. It was originally found in the Middle East but is now grown primarily in Italy. Like quinoa, it's a great source of fiber, protein and iron. "Pearled" farro has had the outer husk of the seed removed allowing for a faster cooking time. This farro only took about 15-20 minutes to prepare. It's a very versatile grain that you could easily eat for breakfast or any time of day. Be sure to rinse the farro before cooking according to package directions. Once cooked and drained, set aside. Heat skillet over medium heat and add 1 Tablespoon of the oil. Salt and pepper the chicken and place in skillet. Cook for approximately 8-10 minutes or until the chicken is cooked through and no longer pink. Meanwhile, bring a saucepan filled with salted water to a boil and cook green beans until crisp-tender, about 4 minutes. Immediately drain the beans and immerse in ice water to stop the cooking process. Drain the beans again and pat dry with a towel. In medium bowl, mix the farro, chicken, green beans, bell peppers, and green onions together. Set aside. In a small bowl mix the marjoram, salt, and last 2 Tablespoons of oil together. Then using the back of a spoon, press the marjoram to release the flavor. To the marjoram mixture, add vinegar, shallot, and mustard then whisk together. Pour over the farro and chicken mixture then toss to coat. Season with salt and pepper to taste. Garnish with goat cheese and serve warm. 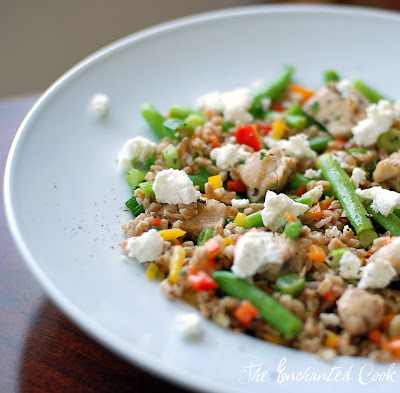 Chicken and Farro Confetti Salad...healthy and delicious! I just discovered farro through a dish from Giada, but I haven't actually made it yet. After reading this post along with one from Joe (Culinary in the Desert) I'm really eager to give this a try! Love your recipe here and the addition of the peppers is ideal for me. Nicely done!! Outstanding..Looks amazing and recipe is just wonderful! bty I have blog award for you, stop by when you find the time! Looks absolutely refreshing and delightful...never tried farro...have to pick it up wen i'm shoppin next time! This recipe looks delicious and healthy as well. Thank you for sharing. I've never cooked with farro. I love trying new foods. This recipes is colorful and nutritious. I can't wait to give it a try. i enjoy using different grains and cous cous for salads too... they are really healthy for you and fill up your tummy. i especially like the photos of the green beans, so crispy and clear. missed you yesterday at FBLA. hope you can make it to the OC Bites event in OC. OOOOOH this looks so good. I'm a huge fan of colorful peppers and this could easily be a family favorite. As ususal your pictures are awesome! Yum! I've never tried farro, but it looks delicious. Beautiful mix of peppers. It really does look healthy and delicious, Veronica. I haven't broken open my O Olive Oil yet, but I can't wait to try it in various recipes. This is such a creative dinner idea! I love chicken but eventually run out of fun ways to dress it up. This will be perfect for next time! Thank you for sharing this wonderful recipe. 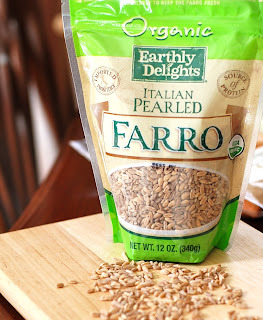 I picked up some farro last week, I haven't used it yet, so thank you for the great idea!! Your salad looks delicious, the marjoram sounds like a wonderful addition to this dish! Hey Veronica just found your blog. Your pictures are amazing! Love how clear the colours are and you have some great recipes as well. Never used farro before but might give this recipe a go. I love farro and am always looking for new ways to make it. This is a gorgeous and delicious looking dish. Thanks for the inspiration. I am enjoying your blog! This looks so wonderful! I cook w quinoa and millet often, but have not come across Farro. I will keep an eye out for it! thx for sharing this delicious recipe! Your photos are beautiful, this looks amazing! I am the same way...I have tons of recipes saved up that I am always meaning to make and never get around to it! This looks really tasty and healthy! V, I was so excited to see you made this farro salad! Your salad looks colorful and tasty. Hope everyone gives farro a try! !